Need a price? Call Jane now for a quote: 949-742-2755. Live in Orange County? Ask about our pickup service! These days, there is no excuse for letting those home movies on VHS, VHS-C, Video8 orHi8 cassettes, MiniDV - or even old 8mm or 16mm film spools - rot away in dusty shoe boxes up on a closet shelf somewhere. Get your old film and video digitized and transferred to DVD or to a hard drive here in Orange County! Need cassette tape repairs? Or audio transferred? We can handle that too. Your Story Here LLC specializes in family video projects and we have transferred thousands of hours of old film and video to DVD and portable hard drives for conversion and editing. (We have also transferred hundreds of hours of audio and been called in to repair bad video transfers!) Our video production and video editing experience with all types of analog and digital files has made us one of the most knowledgeable transfer specialists in Orange County! We are expert at "plain vanilla" transfers and we can also add custom DVD menus, color and contrast correct, we can quickly edit the material into highlights, or even turn the old film or video into a family history video documentary. We customize the DVD box with screen-grabs from your video and the information about your home movie. Each transfer comes with a custom DVD box featuring selected "screen grab" images from your transferred home movies. We also add your family name and other important details such as dates, places or whatever else may be important to your video transfer (see sample). Note: We are not a mass replicator nor do we emblazon your precious home movie transfers with our name and our logos. They are your tapes! All cassette tapes stay on our premises and are never sent interstate for bulk processing. Have some old audio cassettes or even LPs that need to be transferred to CD? Your Story Here can help with your audio transfer needs. Using leading industry software Adobe Audition, we digitize your old LPs or spoken word or music cassettes, filter out clicks and pops, normalize the audio and trim any long silences, insert separate tracks then burn each LP or cassette to CD - being careful to appropriately label each one. Done and dusted! What video & film do you have? many other film and video media. While video cassette transfers to DVD are still very popular and most convenient, customers are increasingly asking us to convert and transfer their precious tapes to a portable hard drive - in full "dv" resolution! Keep in mind that each hour of video will need around 13GB of drive space. Either you supply the drive or we do (charged at cost). Audio transfers - cassettes or LPs - take up a lot less space. One hour of uncompressed audio at 44.1 kHz (the CD standard for audio) needs a little less than 1GB. seeing old film come back to life - like a window to a precious past. transferred cheaply; the right shows "repairs" we had to make. Have you already had your old movies transferred from 8mm film or Video8 to VHS video - and now want to move them to DVD? The advantage of transferring from VHS to DVD is certainly cost: it will be cheaper to go straight from VHS (or even VHS-C) to DVD. And quicker too. If you get a chance to hunt down that old 16mm film or the old 8mm film reels, then you have a chance to improve on the quality of the final video transfer and get at least 480 lines of resolution from the original. How big of an improvement? That depends on the quality and condition of the original 8mm or 16mm film; and the quality of the original Video8 or Hi8 cassettes. In every case, transferring from the original film should give a superior result. Saturation, color balance and contrast can all be improved in old home movies. The condition and format of the original film or video will limit the quality of your video transfer. So too will the method of transfer. What more can be done if you want the very best results from your transfer? Your Story Here LLC Video Transfer can provide a "digital clean up" of the transferred home movie footage. Using the ground-breaking video editing software "Final Cut Pro", our Apple Certified editor will perform a color and a contrast correction to each of the different segments of the video. Depending on the issues presented, there may also be "filter" enhancements available that will further improve the transferred video. Only by going in and looking at each of the different scenes of your priceless home movies can we be sure of the highest quality video restoration. 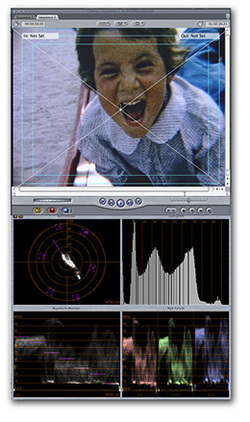 Note: Video restoration is an advanced aspect of video conversion requiring care and patience. Sadly, there is no "restore" button in software that will magically convert compromised footage into pristine pictures! We also offer VHS to DVD transfers, 8mm (super 8 and regular 8) and 16mm film conversions, Hi8 and Video8 transfers as well as miniDV and mini DVD conversions and video editing in Los Angeles County and beyond - by arrangement. Website article: "Transferring Video? Some Things You Should Know Before You Start"
So, you are planning on transferring your 16mm or 8mm film to DVD. Maybe you have the original 16mm or 8mm film and maybe you want to transfer your Video8 or Hi8 video to DVD. Maybe you want to transfer your video to a hard drive. Quite likely you have already transferred video to VHS tapes. In each case, now we are in the digital age, you are going to be "digitizing" your video. When digitizing your home movie video, think about what you want to do with it. Play it on the TV via DVD? That's typical. Maybe you want to upload your old home movies to YouTube and send the link to your kids in college. That would be fun! What about putting a piece on your iPhone or your Android? Did you know that more people are playing movies on their TV via their iPad - does that interest you? Maybe you want to keep your options open. Are you considering creating an "archive" copy of your home movies - to reside on a new hard drive - in the best quality available? You could watch that from your computer (but not your TV). What then? Transferring your tapes to an external hard drive in full "dv" might be your best option. For anyone considering video transfer, keep in mind that there is no one size or one format for digital video. There are many sizes and many formats and most video formats, but not all, involve some form of compression (read: some loss of video quality). Depending then on where you want to display the video, and what options you want to keep open, your video may have different characteristics. And it's useful to think about all this before you order your video transfer, because you can always "dumb down" - but you can't "dumb up". What then are the main attributes of video to keep in mind? 1. Size (in pixels) - standard definition TV is 720 x 480 pixels, HD is 1280 x 720 and 1920 x 1080, iPhone 5 video is 1080p HD, original YouTube was 640 x 360. Any video can be shrunk to fit a small screen - and you will save storage space by doing so. Video can also be expanded, but the quality will always suffer. If you are planning on transferring 8mm film (super 8 or regular 8) to video on DVD then you have some choices on size. It's debatable whether you get any real benefit from going HD with 8mm film though, given the very small size of the the original film frame - 4.8mm - and the limitations imposed by the original camera lens, filming conditions, camera shake etc. 2. Frame rate - i.e. the number of frames flashed on a display screen per second. It's usually 30 for standard definition video; up to 60 (interlaced or progressive) for HD; and 24 frames per second for cinema. Old film - Super 8, Regular 8 or 16mm - had all kinds of frame rates from 9 frames per second to 24. You can reduce video frame rates to 20 or 15 fps if you want to keep the video file small - but the movie may look a little jumpy. Where file size is critical, you can make a big reduction by reducing your video frame rate but its generally best to keep it at (or increase it to) 30 - or 60p for some HD. 3. Data or Bit Rate: If frame size is like the diameter of a pipe, data or bit rate is the speed of the flow. A standard DVD pushes pictures onto the screen at an average of around 7Mbps (megabits per second); a YouTube video may use 2 or 3Mbps; Cable TV HD may be around 15Mbps; Blu-ray disks 30Mbps. You can adjust your video's bit rate settings to reduce the video file size, or if the device demands it (e.g. the Apple iPhone has a 2.5 Mbps limit for video). 4. Audio format: Just as video has a bit rate, so does audio. But compared to video, audio bit rates are tiny. Good quality audio for a web video is 320 Kbps (around one-thousandth of the video bit rate). Nothing to worry about, in our opinion. Common formats for compressed audio (it's usually compressed, unless you are playing a CD) are MP3 and AAC. Uncompressed audio formats like AIFF, WAV, and PCM may get you into trouble if you try to upload the video to the web or if you try to load the video onto a portable device. 5. Video formats: You can tell the current format of a video (any file really) by its suffix. ".mov" means it's a QuickTime file; ".MP4" means it's a, well, MPEG4 file; "wma", "wmv" and ".wav, are all Windows media files; and so on. DVDs use the "MGEG-2" format. Uncompressed video is often known as "DV". What underlies each of these formats is a style of video compression (or "codec"). Common codecs are H.264 (Apple preferred) and WMV9 (Windows preferred).